Proving that it is really possible to get into the RV lifestyle WITHOUT doing it full-time! Our week in St. Augustine, Florida comes to a close tomorrow (Friday), and it has been all that we could have ever hoped it would be! Of course, there will be videos over on our YouTube channel in the coming weeks, but there are already images and words over on our Instagram and Facebook pages, as well as our Twitter feed, so have a look over there. One image we will share here is proof of our very first "meet-up" with fellow YouTubers. 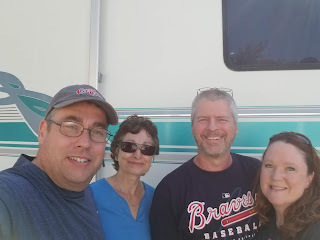 Chris and Lisa Wilson of the "Camp More/Bark Less" channel were nice enough to arrange their schedule so as to be at our campground when we arrived in St. Augustine, and we thoroughly enjoyed meeting them "in the flesh" and getting to know them better! RVing and YouTube-ing has brought us into contact with so many great people, a trend we certainly hope will continue. Be sure to check out youtube.com/campmorebarkless to see Chris and Lisa's RV adventures! ...and be sure to check here, and on all of our social media accounts, for pictures and stories of our fantastic week in St Augustine! Howdy, Wet Campers! Oh, excuse me - I meant "Happy Campers," because all of YOU out there are! It's just US who are Wet Campers, and if Jim Cantore and the crew at The Weather Channel are to be believed, our influence on rainfall in the American Southeast continues to be strong. 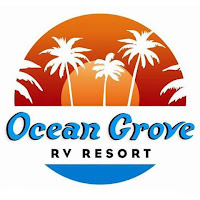 We leave tomorrow afternoon for our week at Ocean Grove RV resort in St. Augustine, Florida, and we'll be taking rainclouds with us! As usual, that won't keep us from somehow finding some fun down there. We plan to visit such local St. Augustine landmarks as the World Golf Hall of Fame and Castillo de San Marcos, and even have our first YouTube meet-up! Chris and Lisa Wilson of YouTube channel "Camp More/Bark Less" (youtube.com/CampMoreBarkLess) will be joining us at the campground for the weekend, and we are really looking forward to meeting them "in the flesh" and comparing notes about doing the RV-thing. We'll post some pics on our Instagram page (@LiveNLearnRV) while we're in the Sunshine State (and hope they live up to that name...), so you'll be able to keep up with our doings a bit. Of course, we'll also have lots of video to share with you when we return, although at the rate the weather is shaping up, it may just be video of us sloshing around in the mud... but hey! - it will be moving pictures of some sort! No camper, no problem! 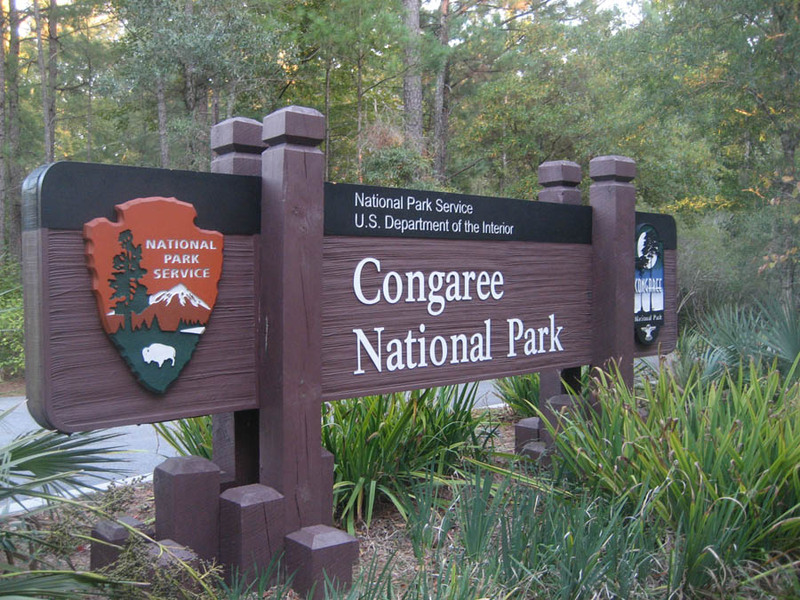 While the "Aluminum Falcon" is in the shop, we got our dose of St. Patrick's Day-green that weekend by taking a day-trip over to South Carolina's only National Park - Congaree National Park! We see the largest intact expanse of old-growth bottomland hardwood forest remaining in the southeastern United States, up-close and personal. Despite its reputation as "nothing but a swamp," we found it to be a lovely, peaceful place. See what we discovered in our latest video over on the YouTube channel! In retrospect, we probably began our RVing life at the worst possible time of year - late summer. Our first "mission" with the Aluminum Falcon to Lake Greenwood State Park, was a glorious time. We had never towed a travel trailer to a campground, never set up a campsite, never had to deal with things like water hookups and propane-powered refrigerators. However, the weather was fantastic - warm and dry, with pleasant breezes coming off Lake Greenwood, and lots of natural scents and sights to enjoy as we lounged and relaxed. That didn't last, though. 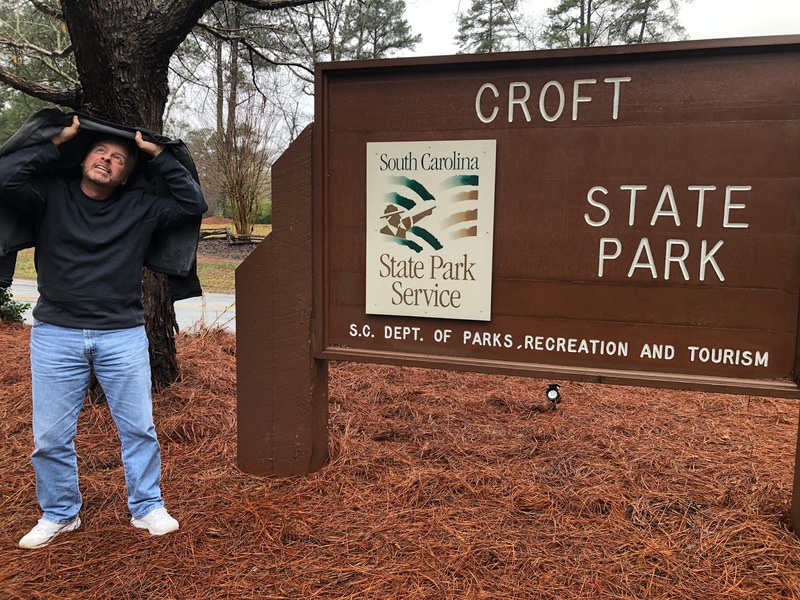 Fall/Winter 2018/19 in the American South was INCREDIBLY cold and rainy, and our next four camping trips were plagued with drenching rains, blistering cold, or some combination of both! We have tried to find the proverbial "silver lining" in all this by convincing ourselves that we now know lots of things about how to camp in BAD weather, and now that springtime approaches, we'll have even more fun going forward learning about camping in GOOD weather!! The ANGRIEST RV vlog Ever Recorded! Well, sometimes the best-laid travel plans just don't work out. In our latest video, you'll see how our trip to take the Aluminum Falcon back to the dealer for some maintenance was only partially successful. You may also see Smokey blow his stack... EEK!!! Hey, Happy Campers! Today's post is just a "status update," to let you know that, just because the world at large considers this time of year to be the camping "off-season," we still have some things going on. However, it did provide some fodder for our next YouTube video! Keep your eyes open this Sunday, when our latest video mis-adventure will debut, and you'll get to see for yourself how we adapted to everything from Mother Nature to the Lodging & Hospitality industry working against us. We haven't pinned down a date for running over to Congaree National Park, as the afore-mentioned Mother Nature seems determined to never again allow the Southern U.S. to see a sunny weekend. When it happens, we'll let you know. St. Augustine is still firmly on the calendar, though! Again, check back either here or on the YouTube channel this Sunday for the new video, and be sure to subscribe to the channel, and share it with others! It's easily found at YouTube.com/LiveNLearnRV. Mission 005 - Aiken State Park, or as we call it, "Camp Spooky"
Peace and quiet. These are just two of the many things RV camping can offer, depending on where and when you go. Can there be such a thing as TOO MUCH peace and quiet? Well, check out the video for our recent long weekend at Aiken State Park for the answer. Again, we won't be doing any camping in February or March, but there will be travels (of sorts) and news to report, so keep your eyes peeled for more words here! Hey, Happy Campers everywhere! Jessie here, and Smokey and I want to share this milestone with all of you! 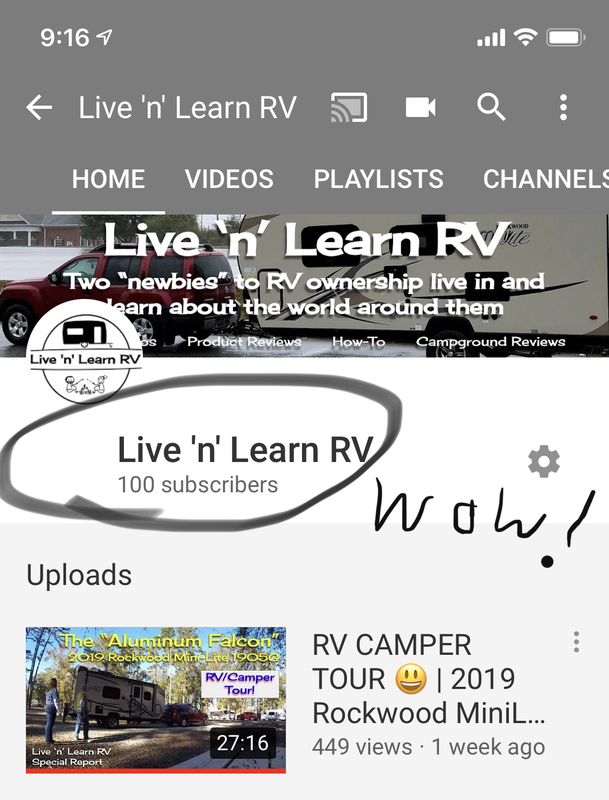 One hundred subscribers on our YouTube channel! It is mind-boggling that anybody at all is interested in our adventures, let alone a hundred somebodies! When we started this blog and the YouTube channel, our goal was to prove to ourselves, and by extension to others, that getting into the "RV lifestyle" did not necessarily mean selling your home and all worldly possessions and roaming the country in a large motorhome. We wanted to prove that it is possible to be "normal," continue to have a home and a job, and still experience RV camping and learn about some our country's natural wonders. At least one hundred people are Livin' and Learnin' right along with us, so why don't you come along, too? If you haven't subscribed, please head over to YouTube.com/LiveNLearnRV and hit that red "subscribe" button, so YouTube will know that you're interested in what we have to say, and click the bell-shaped icon so you'll get notifications whenever we upload a new video. ...and again, THANK YOU to you (first) one hundred folks out there! See the "Aluminum Falcon," Inside and Out! RV Camper Tour! In our latest YouTube video, you finally get to learn all about the "Aluminum Falcon," our home-away-from-home! We'll show you our Rockwood Mini Lite 1905G, a 19-foot travel trailer, which is the basis for our philosophy that you don't necessarily need a Giganto Fifth-Wheel or massive motorhome to get into RV camping! Even though we won't be taking on any new travel "missions" in the "Falcon" until closer to springtime, don't forget that there will be more content coming here throughout February and March, so keep checking in on us! New Year, New Travel Plans! This coming weekend, we'll spend a little closer to home, at Aiken State Park. It's a fairly secluded state park, primarily known for canoeing on the nearby Edisto River. We won't be getting into the water, though (especially in late-January!). In February, we'll be taking the Aluminum Falcon up to Camping World of Spartanburg so the folks there can take care of a few bug-a-boos we've discovered, and get it done well in advance of our one-year warranty expiring! ...when we'll embark on one of our biggest adventures yet! We'll spend the first week of April in St. Augustine, Florida! 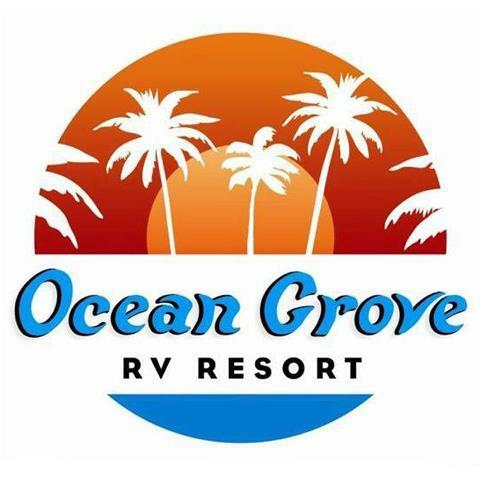 We'll stay at an RV resort down there and experience all sorts of local sites, local historical attractions, and local cuisine! We'll provide more details as these dates approach, and more stories and pictures after the dates pass! Stay tuned! Asheville West KOA was our "base of operations" for our post-Christmas vacation to the NC mountains, and possibly the only local RV park to NOT end up flooded that oh-so-very rainy week! Despite the weather, and the campground undergoing some fairly extensive renovations while we were there, we were impressed! See our review! Mission 004 (Part 2) - Biltmore Estate... IN THE RAIN!!! Our wet-and-wooly post-Christmas vacation in the Asheville, NC region continued with our visit to the fabulous Biltmore Estate! Of course, our luck with camping weather also continued, as seven inches of rain fell during the eighteen hours leading up to our arrival there, so Smokey's first experience at this beautiful place was far from how it should have been. Nevertheless, we managed to spend an entire day there, both Living and Learning about the largest private residence in the United States. See for yourself! Keep tabs on us in the coming weeks, too! Later in January, we'll have a video reviewing the Asheville West KOA, where we stayed for this trip, and in February, we'll finally have a "camper tour" video for you, along with a product review or two. Stay tuned, Happy Campers! Mission 004 (Part 1) - The North Carolina Mountains! Sorry we've been delinquent about keeping the blog updated, but Christmas and all the associated hub-bub have kept us from being as thorough as we'd like around here. What little time that wasn't claimed by Holiday responsibilities was taken up by preparing for our first out-of-state trip in the Aluminum Falcon! Well, we've returned, and can say that we lived to tell several tales! Of course, we won't tell them here - that's what YouTube is for! Our first video of our latest RV adventure covers our trip up the Appalachian foothills to the Asheville West KOA campground, then checking out the small towns of Sylva and Dillsboro the next day, despite a steady, heavy drizzle all day. See for yourself! Keep an eye out for our next video, in which we'll show you our day-long exploration of Asheville's famous Biltmore Estate, and how visiting this site can be done even with raging floodwaters working against you! 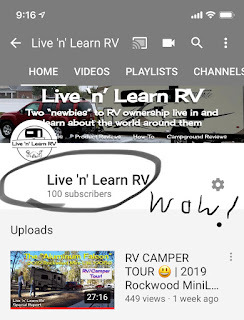 "Live 'n' Learn RV" Takes Flight!!! Mission 003 (Part 1) - RVing for Thanksgiving! "It Could Be Worse... It Could Be Raining..."